Researchers at Duke University are exploring using copper nanowire coated with nickel to transform sunlight and water into hydrogen fuel. Releasing hydrogen from water via solar energy into storable fuel remains one of the greatest challenges of modern chemistry. One of the ways chemists have tried to capture the energy of the sun is through water splitting, in which the atoms of H2O are broken apart so the hydrogen may be collected and used as fuel. Plants do this naturally through photosynthesis, and for half a century, scientists have tried to recreate that process by tinkering with chemical catalysts powered by sunlight. For example indium tin oxide (ITO) is one material scientists have commonly tried to use. Researchers prefer it for its transparency – which allows sunlight to pass through and trigger the water-splitting reactions – and its ability to conduct electricity. But ITO is far from an ideal material. Ben Wiley, assistant professor of chemistry at Duke University explains, “Indium is not very abundant. It is similar in abundance to silver in the earth’s crust.” As a result, solar fuel cells using ITO will likely remain expensive and uncompetitive with conventional energy sources like coal and natural gas, he said. 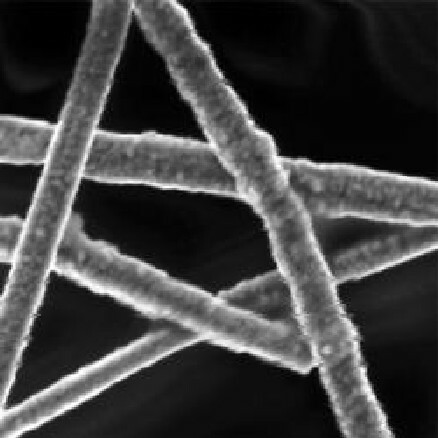 The copper nanowires, seen here with a nickel coating, can split water molecules under the power of sunlight. Image Credit: Zuofeng Chen. Click image for the largest view. Wiley’s lab has created something they hope can replace ITO: copper nanowires fused in a see-through film. The team – including two postdoctoral researchers, a graduate student, and a former graduate student from Duke – published their new approach last month in the chemistry journal Angewandte Chemie. Copper is 1000 times more plentiful and 100 times less expensive than indium. Copper nanowire catalysts also cost less to produce than their ITO counterparts because they can be “printed” on pieces of glass or plastic in a liquid ink form, using a machine that functions much like a printing press. ITO production, by contrast, requires large, sequential chambers of pumps and vacuums that deposit a thin layer of indium atoms at a far slower rate. The copper nanowire films consist of networks of microscopic metal rods, the properties and applications of which Wiley’s lab has studied for years. The nanowires provide a high surface area for catalyzing chemistry, and Wiley’s team experimented with coating them in either cobalt or nickel – metals that serve as the actual chemical catalyst. Even with a coat of cobalt or nickel, the nanowire films allow nearly seven times more sunlight to pass through than ITO. The films are also flexible, leading Wiley to imagine the completed fuel production cells one day being attached to backpacks or cars. In the meantime, engineering and chemistry challenges remain. The nanowire films carry out only one half of the water-splitting equation, a process called water oxidation. The other half of the reaction involves using the electrons obtained from water oxidation to reduce water to hydrogen. Wiley’s team expects to publish their work on this process in the coming year. This is progress. The copper nanowire has been an item of interest for three or four years with no commercial applications making news. The applications for the copper nanowire are very wide indeed and the potential beyond harvesting sunlight to make fuel extends into the tools and devices we use. Copper nanowire is an extremely high potential field and it’s gratifying to see the field widen further. Now for a commercial application that has a big impact – it can’t be far off now.